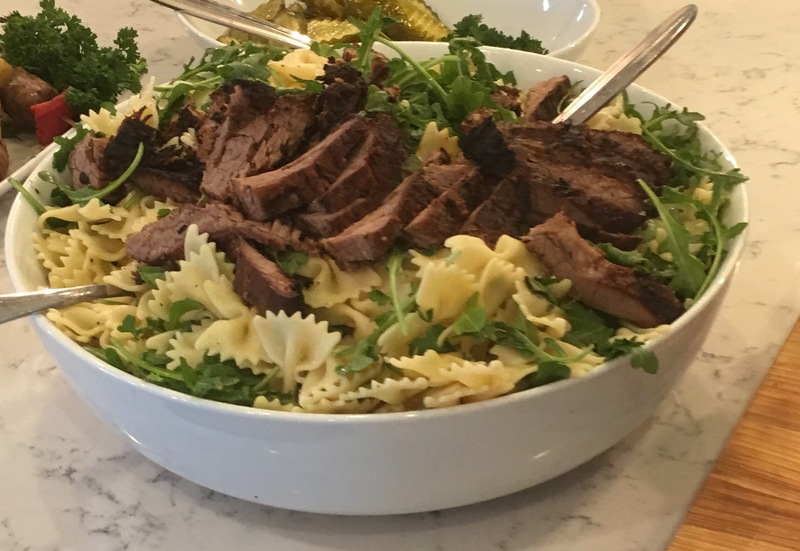 This dish is a balance of cold pasta and hot steak, zesty lemon and fresh cilantro, comforting farfalle pasta and herbaceous arugula. Cook your farfalle in salted boiling water, drain, drizzle olive oil and toss. Refrigerate. Wash and set aside arugula and roughly chopped, destemmed cilantro. Let your steaks rest out of the fridge on a pan preparing them for the grill. Just before searing pat dry with a paper towel, salt and pepper your steaks. Sear to medium rare or how you like to have your steak. Set your steaks aside and let them steaks rest and assemble your pasta. Assembly: In a large serving bowl dress your pasta with your freshly squeezed lemon juice, salt and pepper. Toss thoroughly. Add your arugula and cilantro. Toss. Slice your steak no thicker than 1/8 of an inch and lay your steaks on top of your pasta. Sprinkle salt and pepper on your steak and serve. Taste and adjust your salt and pepper.